Chico & Delamar. Two things that go as well as puto & dinuguan, coffee and cigarettes, and whatever else that the universe has decided should go with one another. The pair is so awesome that their radio show, The Morning Rush on RX 93.1 is hard to tops. It's RX’s most popular show, and it enjoys critical success as well. It is a 19th KBP Golden Dove awardee for Best Comedy Program. Now, That's one for the books! "Signs That Nobody Loves You” ("You move out of an orphanage—into a home for the aged," answers one Spy Shadow). "Things You've Said After a Break-Up" ("Kung continent nga naghihiwalay, tayo pa." says one Ur Girl Next Door." With a decade's worth of funnies, it's but natural for The Morning Rush’s Top 10 to become something more than a portion of a radio show. Voila: It is now a book. 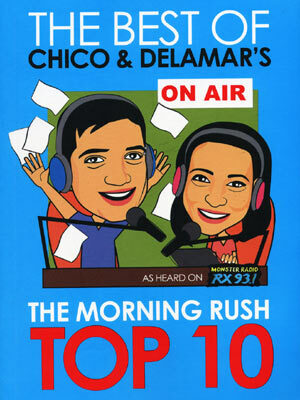 Summit Books has recently published The Best of Chico & Delamar’s The Morning Rush Top 10, and believe you us: Hella funny. Over 200 pages of non-stop the best Pinoy humor. We were reading the book the whole week and of course it inspired our own list: The Top 10 Tunay-Na-Lalaki moments in the book (the book actually has a TNL-inspired list, as well). Go ahead and love what you see. Then get out and snag your own copy!